Wash the eggplants then cut them half vertically. Take the eggplant halves to an oven-safe glass container and turn them upside down (peel is up). Preheat oven to 400 F and roast the eggplants for 30 minutes. Take them out and let them cool until it is comfortable to touch them with your bare hands. Take a large dish and add pureed eggplant, oats, panko, nutritional yeast, flax egg, salt, and pepper and mix them thoroughly with a wooden spoon. Leave in the fridge for 20-30 minutes for the oats and the flour to absorb any excess moisture. Take a tablespoon of the mixture and form the balls with your hands and place them on a parchment lined cookie sheet. 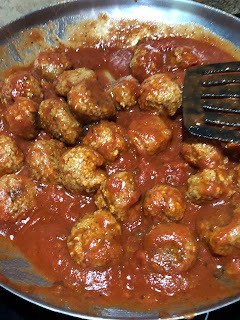 Serve with Pasta Sauce. Makes 28 balls.